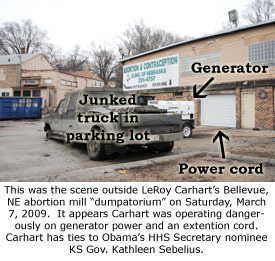 “Butcher of Bellevue” Strikes: 17-Week Abortion Gone Wrong At Carhart’s Nebraska Abortion Mill, 3/27/2017 Carhart Subpoenas Seek Records of Baby Parts Trafficking & Aborted Babies Born Alive New 911 Recording: Incomplete Abortion, Bleeding Hospitalizes Carhart Nebraska Patient What would a late-term abortionist say to med students? I found out. Carhart Worker to 911: “We had an issue with the procedure” 911: Moans, Screams Heard from Botched Abortion Victim at Carhart's Nebraska Clinic - March 31, 2012 Nebraska Attorney General Seeks License Revocation of Carhart's Only Nurse for Improperly Drugging Patients, Other Violations - May 22, 2013 The "Abortion Contraception Clinic" is also known as the "Bellevue Health Center." See clinic license documents below. AbortionClinics.org has two sister clinics -- one in Bethesda, MD, and one in Bellevue, NE. Corporation registration for the state of Nebraska. Expired/inactive corporation registration for the state of Nebraska. Maryland abortion clinic license application. Note physical "agency address" is in Bethesda, MD, while mailing address is in Bellevue, NE (site of sister clinic). Attorney General Jon Bruning announces his intent to seek license revocation for abortion nurse Lindsey Creekmore, due to substandard care practices that endanger public health and safety. Official state petition to revoke Lindsey Creekmore's license for failure to follow patient medication orders and improperly delegating patient care to unlicensed staff.